You are here: Home » Will Navy Do This to Air Force Again? Will Navy Do This to Air Force Again? Last season Navy defeated Air Force. This game proved to be a watershed game for the Middies who lost to Air Force the previous two seasons, and thus surrendered the Commander-In-Chief’s trophy to the Falcons. If there is anyone in the nation who understands how to defend Navy it has to be the Air Force Falcons. Similar to Army, the Falcons also incorporate option schemes into their offense, thus have the most experience, and presumably the greatest chance to devise a defensive scheme to stop the Flexbone Offense. For the last few seasons Air Forces has used a 3-4 defensive scheme against Navy. I anticipated watching the latest installment of this game to see how Navy would attack Air Force, a team that has had at least enough success to beat them in consecutive seasons. One of the first things I saw was Air Force aligning their defensive tackles in a position to take the dive phase on triple option. The next component of the Air Force scheme was to have their inside linebackers be very active pre and post-snap attacking the Navy offense. There were numerous times where they showed blitz presnap, would back off just before the snap, then attack aggressively when the ball was snapped. Often times this involved them getting the backside inside linebacker involved on the playside. These two basic defensive characteristics allowed the Air Force defense to do a number of things to try to stymie the Navy attack. They could play aggressive with the DE on the OT when he tried to release off the line, and they could show a number of looks when attacking the three phases of the triple option. 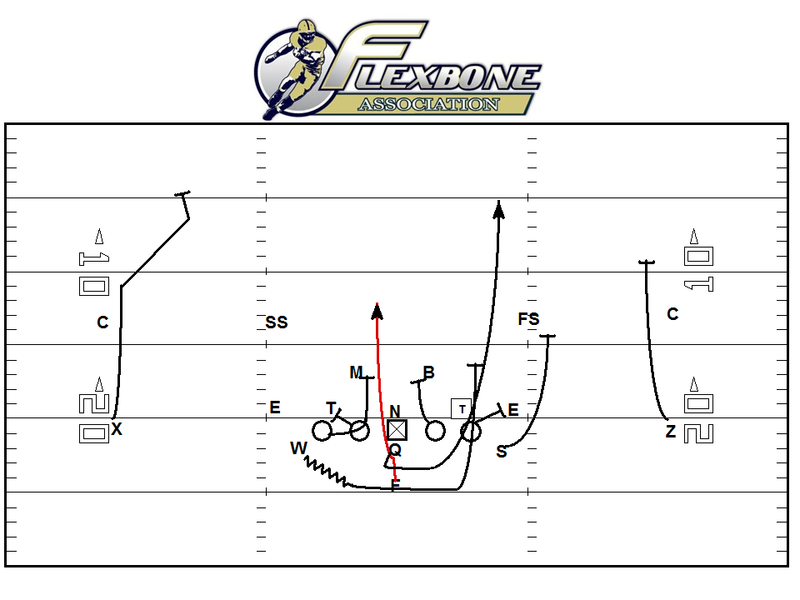 Navy’s main plan of attack against this scheme was to align in double flex and run alot of zone option, triple and toss. One wrinkle they added however was a very clever adjustment off of midline that allowed them to attack the backside. As illustrated above Air Force was very aggressive with their inside linebackers, often getting their backside linebacker involved in the playside. 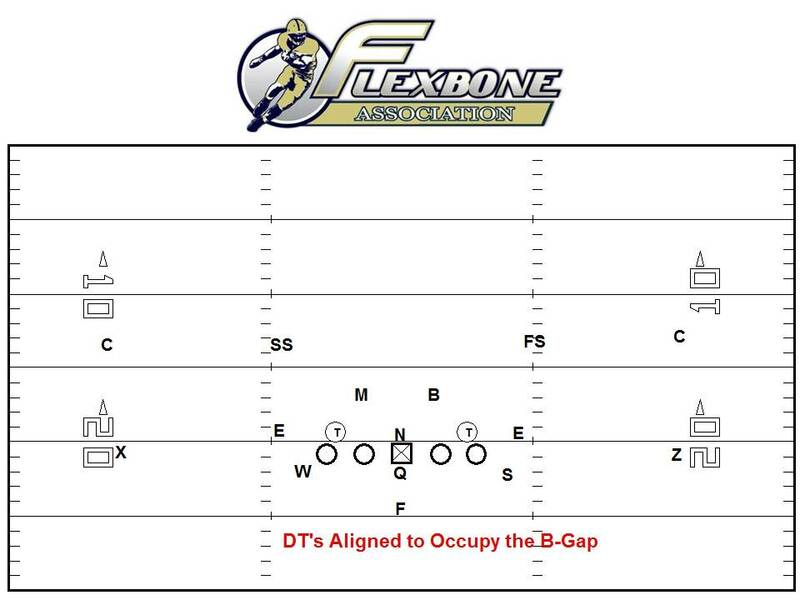 One of Ivin Jasper‘s answers to this problem was to run midline, and fold the backside guard and tackle, giving the B-Back a nice running lane behind the center (see diagram below). This isn’t something that should be would need to be run more than 3-4-5 times a game. Running it just enough makes the defense wrong in their run fits and slows them down. This will make them hesitate and not trust their assignments throughout the course of a game. 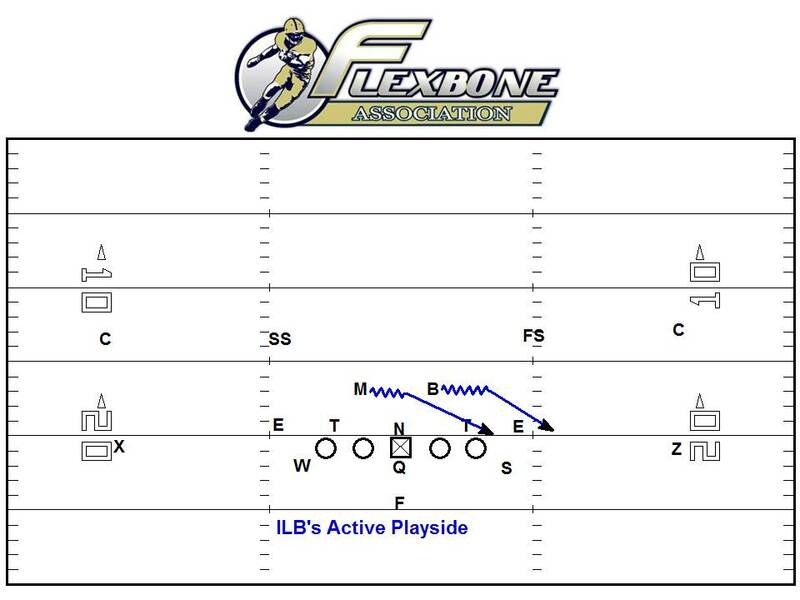 Once again we see the answers that WORK are those small adjustments to what the Flexbone Offense already is. The answers have not and will never come from running zone read or jet from the gun. The answers will not come from putting in a tight end and running outside veer over and over. Everything you need for lasting success or to turn your program around is all here. I’ve helped coaches turn their program around, or save their jobs for years now. Don’t wait until it’s too late.